Osbern (d. c.1090) was born in Canterbury and was brought up by the dean of the cathedral, where he became a monk and, later, the prior. He is said to have written treatises on music, but is most famous for writing saints' lives, and for translating others from Anglo-Saxon into Latin. St. Dunstan (960-980) was abbot Glastonbury, and later bishop of Worcester and London, before finally becoming archbishop of Canterbury. 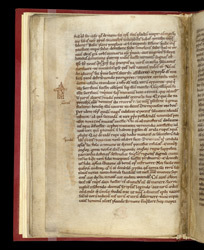 This copy of Osbern's biography of Dunstan was owned by St. Mary's Abbey, York, in the Middle Ages. In the left margin alongside a passage in the text which mentions an altar in the form of a pyramid, a 12th-century reader has drawn a pyramid, above a similar drawing of a sepulchre.